The practical realization of neuro-memristive systems requires highly accurate simulation models, robust devices and validations on device characteristics. This chapter covers the basics of memristor characteristics, models and a succinct review of practically realized memristive devices. Memristors represent a class of two terminal resistive switching multi-state memory devices that can be compatible with existing integrated circuit technologies. 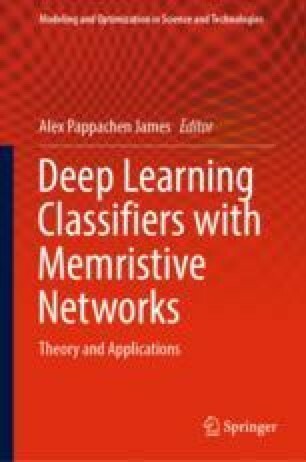 The modeling of memristors for very large scale simulations requires to accurately capture process variations and other non-idealities from real devices for ensuring the validity of deep neural network architecture designs with memristors. Memristor is a low power device with a small on-chip area and variable resistance. Hysteresis, POP and DRM are methods to characterize the behavior of memristor. There are several types of memristor models. Some of them are memristor models with window functions, models with fitting parameters, models for particular devices and models suitable for large scale simulations. Different materials exhibit the memristive behavior. Each material or combination of materials possesses unique characteristics suitable for certain applications and compatible with particular devices.